Angiotensin II receptor blockers can lead to an increase in plasma renin activity and plasma angiotensin II levels. These are effectively suppressed by cilnidipine but not amlodipine. Thus, in effect, cilnidipine is expected to constitute a synergistic combination with angiotensin II receptor blockers. In an animal experiment, amlodipine, cilnidipine, and candesartan were administered to dogs for 4 weeks. The QT interval and monophasic action potential duration were shortened only in the cilnidipine groups; however, such effects were not demonstrated in the amlodipine or candesartan group. Plasma angiotensin II and aldosterone concentrations were reported to be decreased in the cilnidipine group and elevated in the amlodipine group. Long QT interval has been reported in various cardiovascular diseases associated with hypertrophy and also in end-stage renal disease. Long-term treatment of L/N type Ca 2+ channels may provide a novel strategy to prevent sudden cardiac death related to QT prolongation. Ca 2+ influx, probably through N-type Ca 2+ channels, is involved in the process of pancreatic insulin secretion from β-cells and glucagon secretion from alpha cells in the islets of Langerhans. In a study on fructose-fed rats, insulin sensitivity was significantly lower than in controls and insulin resistance was shown to improve significantly after cilnidipine treatment. Thus, N-type Ca 2+ channels have an important role to play in glucose homeostasis. Cilnidipine is a promising 4 th generation dual L/N type Ca 2+ channel blocking agent. 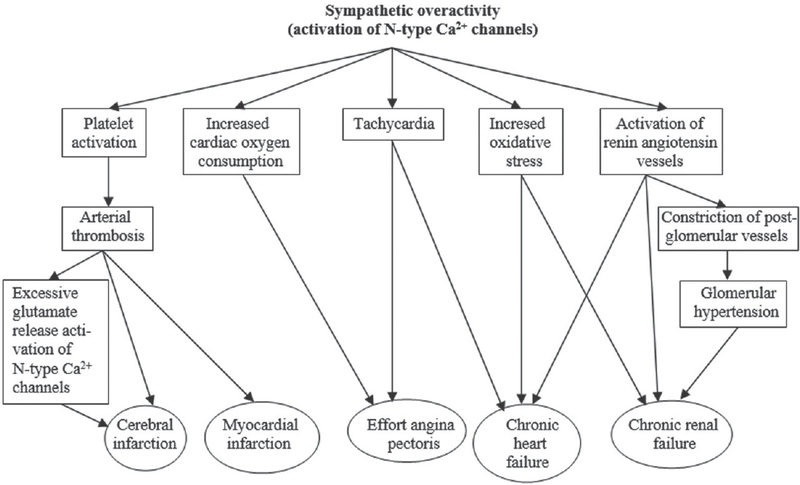 The blockade of N-type Ca 2+ channels results in neurohormonal regulation (sympathetic nervous system and renin-angiotensin-aldosterone system) in the cardiovascular system. This results in favorable effects in the prevention of number of complications of hypertension, the most notable being prevention of progression of proteinuria and renal disease. Thus, it is expected to be a very useful addition in the current armamentarium for the treatment of hypertension. Ertel EA, Campbell KP, Harpold MM, Hofmann F, Mori Y, Perez-Reyes E, et al. Nomenclature of voltage-gated calcium channels. Neuron 2000;25:533-5. Miljanich GP, Ramachandran J. Antagonists of neuronal calcium channels: Structure, function, and therapeutic implications. Annu Rev Pharmacol Toxicol 1995;35:707-34. Uneyama H, Uchida H, Konda T, Yoshimoto R, Akaike N. Selectivity of dihydropyridines for cardiac L-type and sympathetic N-type Ca2+channels. Eur J Pharmacol 1999;373:93-100. Nagahama S, Norimatsu T, Maki T, Yasuda M, Tanaka S. The effect of combination therapy with an L/N-Type Ca(2+) channel blocker, cilnidipine, and an angiotensin II receptor blocker on the blood pressure and heart rate in Japanese hypertensive patients: An observational study conducted in Japan. Hypertens Res 2007;30:815-22. Yamagishi T. Beneficial effect of cilnidipine on morning hypertension and white-coat effect in patients with essential hypertension. Hypertens Res 2006;29:339-44. Manjunath G, Tighiouart H, Ibrahim H, MacLeod B, Salem DN, Griffith JL, et al. Level of kidney function as a risk factor for atherosclerotic cardiovascular outcomes in the community. J Am Coll Cardiol 2003;41:47-55. Konno Y, Kimura K. Vasodilatory effect of cilnidipine, an L-type and N-type calcium channel blocker, on rat kidney glomerular arterioles. Int Heart J 2008;49:723-32. Rose GW, Kanno Y, Ikebukuro H, Kaneko M, Kaneko K, Kanno T, et al. Cilnidipine is as effective as benazepril for control of blood pressure and proteinuria in hypertensive patients with benign nephrosclerosis. Hypertens Res 2001;24:377-83. Katayama K, Nomura S, Ishikawa H, Murata T, Koyabu S, Nakano T. Comparison between valsartan and valsartan plus cilnidipine in type II diabetics with normo- and microalbuminuria. Kidney Int 2006;70:151-6. Fujita T, Ando K, Nishimura H, Ideura T, Yasuda G, Isshiki M, et al. Antiproteinuric effect of the calcium channel blocker cilnidipine added to renin-angiotensin inhibition in hypertensive patients with chronic renal disease. Kidney Int 2007;72:1543-9. Toba H, Yoshida M, Tojo C, Nakano A, Oshima Y, Kojima Y, et al. L/N-type calcium channel blocker cilnidipine ameliorates proteinuria and inhibits the renal renin-angiotensin-aldosterone system in deoxycorticosterone acetate-salt hypertensive rats. Hypertens Res 2011;34:521-9. Fan L, Yang Q, Xiao XQ, Grove KL, Huang Y, Chen ZW, et al. Dual actions of cilnidipine in human internal thoracic artery: Inhibition of calcium channels and enhancement of endothelial nitric oxide synthase. J Thorac Cardiovasc Surg 2011;141:1063-9. Aritomi S, Niinuma K, Ogawa T, Konda T, Nitta K. Effects of an N-type calcium antagonist on angiotensin II-renin feedback. Am J Nephrol 2011;33:168-75. Takahara A, Nakamura Y, Wagatsuma H, Aritomi S, Nakayama A, Satoh Y, et al. Long-term blockade of L/N-type Ca (2+) channels by cilnidipine ameliorates repolarization abnormality of the canine hypertrophied heart. Br J Pharmacol 2009;158:1366-74. Takeda S, Ueshiba H, Hattori Y, Irie M. Cilnidipine, the N- And L-type calcium channel antagonist, reduced on 24-h urinary catecholamines and C-peptide in hypertensive non-insulin-dependent diabetes mellitus. Diabetes Res Clin Pract 1999;44:197-205.